Diana Wynne Jones is an author I’ve meant to read for a long time. In fact, I’ve had Howl’s Moving Castle on my list for many years now and never got around to reading it. 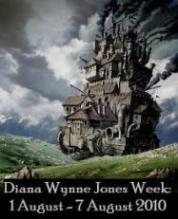 So when I saw that Jenny’s at Jenny’s Books was hosting a Diana Wynne Jones Week, I thought this would be the perfect opportunity to read one of her books. A quick library search made me realize I was in for a challenge in just picking a book (she’s a prolific writer) but decided on Witch Week and put Howl’s Moving Castle on hold as well. Witch Week is about students at a boarding school in England. It’s an alternative England where magic is banned and witches are burned when found. The school, Larwood House, is home to many witch orphans so when a note is found in classroom 6B that says, “Someone in this class is a witch,” chaos begins. The note starts off a flurry of accidental discoveries by students, false accusations are hurled at everyone, and an inquisitor is brought to the school to find the witch. I started this book with visions of Harry Potter. Boarding school, witches, you know, general Harry Potter stuff. I found a book full of something else entirely. The magic is different and it’s a wonderful sort of magic that comes from being and it’s enchanting to see the students find themselves in the mess they create. The students. I don’t know where to start with this one because I didn’t actually like any of them at the start. They’re all mean in a way, some catty, some obnoxious and I couldn’t understand why I was supposed to dislike them all. Eventually, I began to see the kids emerge and you do like them more and more. They’re real kids, and by the end, very likable people. The school is full of oddball characters — for instance, Miss Hodge, who wants desperately to marry Mr. Wentworth, another teacher at the school. She’s intent on making him like her and seeing the value in becoming her husband that she’s short sighted about everything else. She’s incredibly annoying and the use of her brain is relegated to finding a husband instead of helping any of the children. There are some amusing and funny moments along the way that make the story very entertaining. While I was let down by the ending, not in a bad way I was just hoping that it would go another way, I think there is a sequel to this one (Year of the Griffin maybe) and sequels always make me happy so my deal with the ending is minor. I don’t know why Wynne Jones never made it high up on my TBR but thanks to this week, I now have another author to add to my list and about 40 books to pick from for my next read. That makes me happy I took the time to read this one. She has been on my tbr list for years, but I still haven’t read any of her books 🙂 Great review! Yay, I’m glad you liked it! I am not wild about the ending myself–as you say, it’s not bad, but I wished t would have come out differently. There aren’t sequels to this per se, but it’s part of a series about Chrestomanci. The first two are Charmed Life and The Lives of Christopher Chant (the latter is about young Chrestomanci), and then there is The Magicians of Caprona and The Pinhoe Egg, and also Conrad’s fate, which features a teenage Chrestomanci. But these characters, sadly, do not return. A series you say. That I can get in to. Thanks for the titles!